The modern immigration wave from Asia has accounted for one-quarter of all immigrants who have arrived in the U.S. since 1965. Today 59% of the U.S. Asian population was born in another country. That share rises to 73% among adult Asians. Yet, when and how Asian immigrants arrived in the U.S. varies, which helps explain why some groups have greater shares of U.S. born or foreign born among their populations. For example, only 27% of Japanese, who began arriving in the 19th century as plantation workers in what is now the state of Hawaii, are immigrants. By contrast, many Bhutanese arrived recently as refugees, and nearly all (92%) are foreign born. Fast population growth suggests they will eventually be the nation’s largest immigrant group. 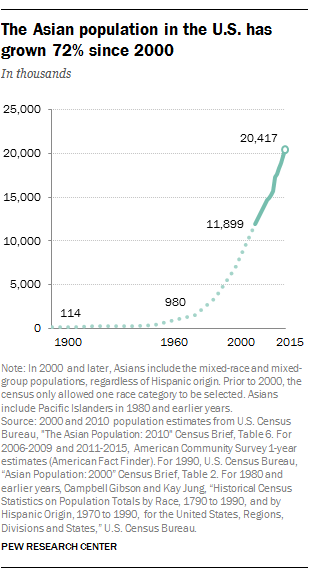 Looking forward, Asians are projected to become the largest immigrant group in the country, surpassing Hispanics in 2055. In 50 years, Asians will make up 38% of all U.S. immigrants, while Hispanics will make up 31% of the nation’s immigrant population. Bhutanese (92%) and Nepalese (88%) have the highest foreign-born shares, followed by Burmese (85%), Malaysians (83%) and Sri Lankans (78%). At the other end of the spectrum, Hmong (39%) and Japanese (27%) have the lowest share of foreign born among U.S. Asians. More Asian immigrants have arrived in the U.S. than Hispanic immigrants each year since 2010. They include new arrivals from China and India, two of the top three countries of origin (along with Mexico), with many looking to study, work or reunite with family. Other Asian immigrants have come to the U.S. as refugees; many arrived at the end of the Vietnam War, and others from Bhutan and Burma came more recently. Asian unauthorized immigrants made up about 13% of the 11.1 million unauthorized immigrants who live in the U.S. Unauthorized immigrants from four nations in Asia were among the top 15 origin groups for unauthorized immigrants – India (500,000), China (325,000), the Philippines (180,000) and Korea (160,000). The U.S. Asian population overall does well on measures of economic well-being compared with the U.S. population as a whole, but this varies widely among Asian subgroups. The median annual household income of households headed by Asian Americans is $73,060, compared with $53,600 among all U.S. households. But these overall figures hide differences among Asian origin groups. Four groups have household incomes well below the median household income for all Americans: Bangladeshi ($49,800), Hmong ($48,000), Nepalese ($43,500) and Burmese ($36,000). By contrast, Indian households have the highest median income ($100,000), followed by Filipinos ($80,000), Japanese and Sri Lankans (each $74,000). Asians overall were also less likely than the general U.S. population to live in poverty in 2015 (12.1% vs. 15.1%). But again, there are large differences between Asian subgroups. Eight of the 19 Asian groups analyzed had poverty rates higher than the U.S. average. Hmong (28.3%), Bhutanese (33.3%) and Burmese (35.0%) had the highest poverty rates among Asian groups, while the lowest rates were among Filipinos (7.5%), Indians (7.5%) and Japanese (8.4%). About half of Asians ages 25 and older (51%) have a bachelor’s degree or more, compared with 30% of all Americans this age. These shares vary widely by Asian origin group. Indians have the highest level of educational attainment among Asian Americans, with 72% holding a bachelor’s degree or more in 2015. A majority of Sri Lankan (57%), Mongolian (59%) and Malaysian (60%) adults 25 and older have a bachelor’s degree or more. But lower shares of adults have a bachelor’s degree or more for Cambodians (18%), Hmong (17%), Laotians (16%) and Bhutanese (9%). Asians have a lower homeownership rate (57%) than the U.S. public overall (63%). All Asian-headed households – except for those headed by a Vietnamese (65%) or Japanese (63%) individual – are less likely to own a home than American households overall. Households headed by some Asian groups have homeownership rates well below the U.S. average. For example, only about quarter of households headed by Nepalese (24%) and a third of Burmese (33%) owned their home in 2015. Nevertheless, homeownership is on the rise among Asian Americans. In 2000, 53% of Asian household heads were homeowners. By 2015, that share had risen to 57%. Seven-in-ten Asians in the U.S. ages 5 and older spoke English proficiently in 2015, but this share varies widely across Asian subgroups. Large majorities of Japanese (84%), Filipinos (82%) and Indians (80%) speak English proficiently. By contrast, Bhutanese (27%) and Burmese (28%) – both groups with large populations of recently arrived immigrants – have some of the lowest rates of English proficiency. U.S.-born Asians (94%) are more likely than foreign-born Asians (55%) to speak English proficiently. Meanwhile, 32% of Asian Americans overall speak only English in their homes, while 68% speak a language other than English at home. About 26% of Asians live in multigenerational households, a higher share than the U.S. overall (19%). Multigenerational families are households that include two or more adult generations or one that includes both grandparents and grandchildren. About half of Bhutanese (53%) and a large percentage of Cambodians (41%) and Laotians (38%) live in multigenerational households. On the other hand, only 11% of Malaysians and 16% of Mongolians live in multigenerational households. Nearly half (45%) of U.S. Asians live in the West, with about one-third (31%) in California alone. Some 23% of Asian Americans live in the South, 20% in the Northeast and 12% in the Midwest. Aside from Hawaii, where U.S. Asians accounted for 56% of the population in 2015, Asians make up the largest share of the overall population in California (16%), New Jersey (10%), Nevada (10%) and Washington (10%).